Kerala, one of India's most developed states, has witnessed a series of brutal political murders in recent years, writes BBC Hindi's Divya Arya. 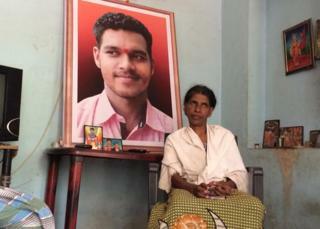 Sujith PV, 26, was killed in February and his mother, Sulojana M, still remembers her son's murder in painful detail. "They struck him with a pipe, broke his skull and bones, and then hacked him to death in front of my eyes." Sulojana, her husband and their two sons were sleeping at home in Kannur district when they were woken up by some people. "Around 20 people surrounded him [PV Sujith], we knew many of them from our neighbourhood, they were all left party supporters," she says. Mr Sujith was a member of the Rashtriya Swayamsevak Sangh (RSS), the Hindu nationalist organisation from which Prime Minister Narendra Modi's Bharatiya Janata Party (BJP) draws its ideological roots. Six workers of the Communist Party of India-Marxist (CPI-M) were arrested for his murder. His murder was the latest in the decades-old string of political vendetta killings between the left and the right in some parts of Kerala. Kerala's Crime Records Bureau estimates that at least 100 people have been murdered and many more injured in political violence in the last 10 years. Most cases of political crimes have occurred in Kannur and Thalassery in north Kerala's Malabar region. The issue of political violence has been in focus in recent days as the state has been in the midst of assembly elections - voting was held on Monday and a new government would take over after the votes are counted on Thursday. "The left rules this area like the Gulag [cruel labour camps in 1930-1950 run by Soviet dictator Joseph Stalin] and the RSS is no less dogmatic, bloody and narrow minded, so violence is inevitable," says novelist Paul Zacharia. The CPI(M) has a strong support base and generations of loyal party workers in the Malabar region. The region is also important for the BJP's ambitions because it's one of the party's few strongholds in Kerala, which has been traditionally ruled by either Congress-led governments or a coalition of the left parties. Mr Sujith's parents were supporters of the CPI(M) but when he turned 18, he decided to support the BJP. The family lived together happily and supported different ideologies in elections, but political parties were obviously not happy with such arrangements. KP Surendra of the CPI(M) was 27 when he was attacked allegedly by a group of RSS supporters with swords in 1986. He survived, but deep gashes caused permanent damage to his left foot, leaving him incapable of joining his dream job in the police force. "The man who led the attack was accused of leading many other such killings, he was also killed a few months later," he says. Both parties encourage workers to build memorials for killed supporters which are then used to sustain anger and whip up passions. However, in some cases the politics of revenge has been jettisoned and the families of those killed have decided to take on their rivals in the election arena. For instance, Rama KK - wife of left leader TP Chandrasekharan who was hacked to death in 2012 by his former CPI(M) colleagues when he broke away from the party and formed his own Revolutionary Marxist Party (RMP) - contested the recent assembly polls against Communists. "My son was very agitated and wanted to avenge his father's killing, but with time he understood the futility of this and now he is helping me fight for a different kind of politics in this area," she says. Many believe that Mr Chandrasekharan's murder was a tipping point in the state politics when young voters started feeling alienated from the CPI(M). The BJP, which is yet to see any significant electoral success in Kerala, has tried to attract young voters in this week's election by presenting itself as the only force that has been able to challenge the left in its own backyard. Mr Zacharia says the BJP's claims are not completely unfounded because of the Congress government's "weak response" to cases of political violence. "Even in areas with Congress legislators, the administration and the police look the other way when such violence happens and this has created distortion in the politics of the region. "Political violence has, in fact, been normalised in the state," he adds.